FM Emory Tate hits the Jackpot in Las Vegas!! 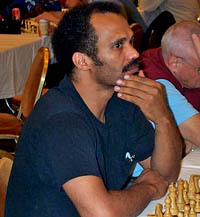 FM Emory Tate, forever the tactical gunslinger at the chess board, went to Las Vegas for the National Open to throw his lot in with a horde of strong players. Many of the big guns came to battle it out, but the final tally showed GM Alexander Yermolinsky and the surprising GM Walter Browne besting the field with 5½ points. Perhaps Browne has disproved critics who thought his best chess was behind him; he has this tournament several times. FM Tate finished with a respectable 4½ which was good enough to win 1st place under 2400 and a prize of $1487.50. Despite Tate's strength, he is still able to play for these sectional prizes which is a nightmare for his peers. While chopping up his other opponents, he lost only to IM Eugene Perelshteyn (2528), but ended the tournament on a high note by beating GM Ildar Ibragimov (2703). While Tate certainly has a handsome collection of GM scalps, he must begin to put a string of results together so he can earn the GM title he's certainly capable of getting.